Still to this day I can’t believe that I’ve actually been to the frozen isle of the north. 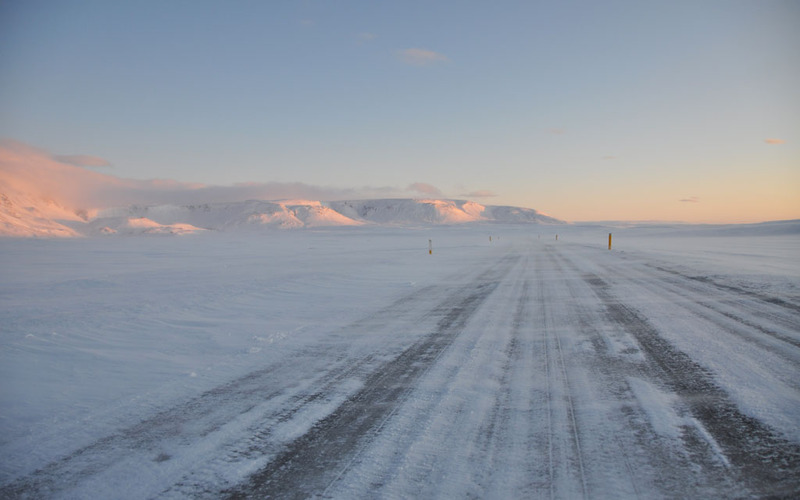 Forget any preconceptions of Iceland as a desolate ice island out in the middle of nowhere, with not a lot going on. Yes. It is out in the middle of nowhere, however, it is anything but dull. The country boasts a truly unique and diverse landscape of glacial waterfalls, smouldering volcanoes and spurting geysers, a dynamic culture, a wild history as well as an overwhelming friendliness of its people. Nick and I flew over for a long weekend but we could have easily stayed for longer. 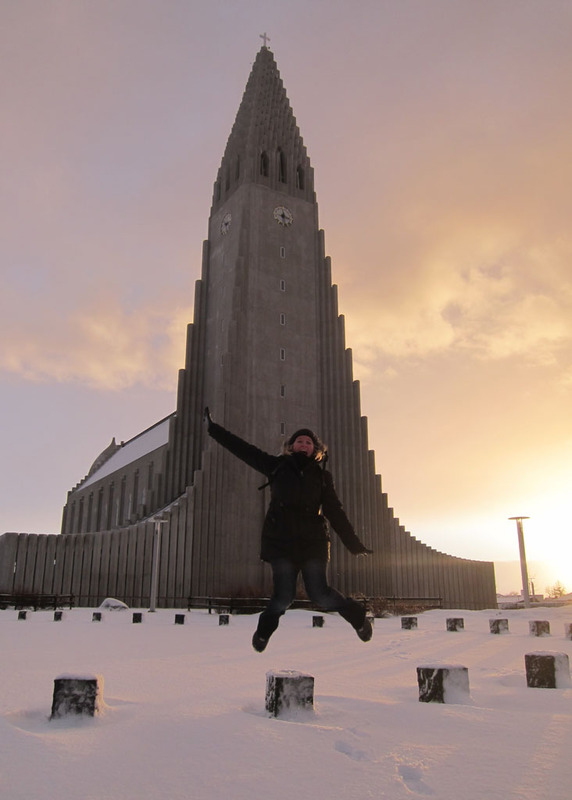 In the space of a few days Iceland certainly made a great impression and left us with a strong desire to return. Planning a trip to Iceland in January, Nick and I had prepared for it to be cold – it was the middle of winter after all – but for just how cold that cold would be, I wasn’t prepared for. 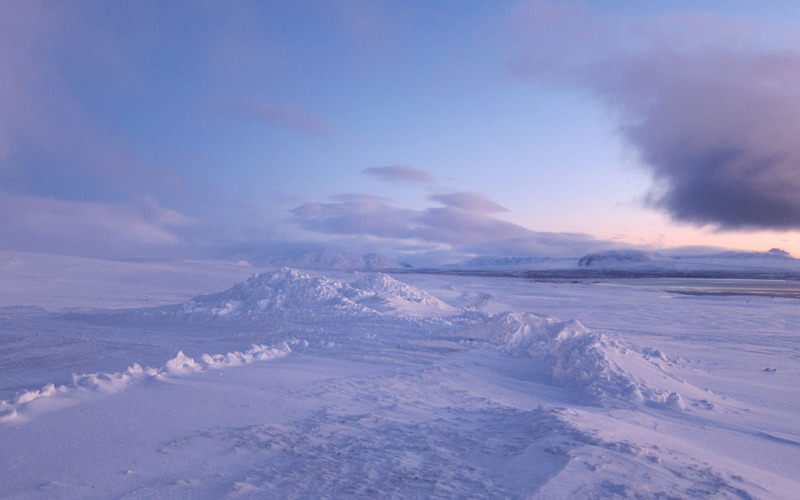 My thoughts prior to leaving London were ‘how dark and cold could it really be?’ Just two months prior we travelled around Scandinavia in conditions that seemed not dissimilar however Iceland was on a whole other level. 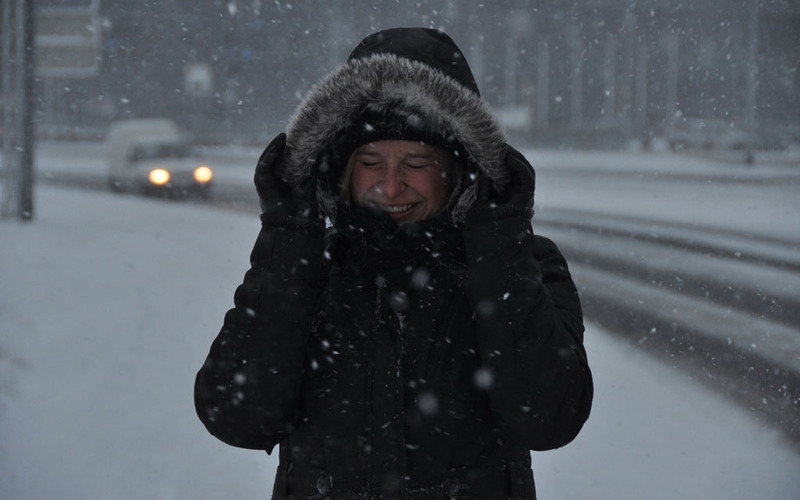 Our first morning in Reykjavík saw us fight our way through what can only be described as blizzard conditions. Our eyes barely staying open as the snow belted down. Little did we know that this was not the norm, and in just a few short hours this crazy weather would simply roll on by, the sun would shine in spectacular fashion (far brighter than I thought it would) and hang around for the remainder of our stay. Thinking that this weather was here to stay though, Nick and I braced ourselves and took to the streets with vigour and several layers of clothing. 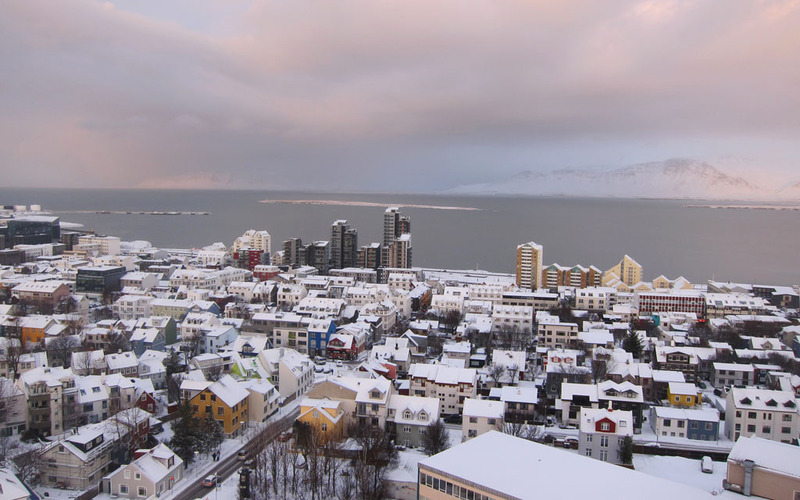 We trudged our way through the snow, having to turn our heads from the onslaught of icy winds, to finally reach our destination – Reykjavík Harbour. Generally a rather picturesque spot, the working harbour offers magnificent views of the surrounding mountains and a calm bay docked with fishing vessels and whale watching boats. Unfortunately it was not as pleasant a walk as we were told it would be. The fierce wind meant that we could barely walk let alone take a photo. It would have been a pretty funny sight seeing us out there battling against the wind. Though I think the fishing vessels had it worse, they were getting tossed about all over the place. Desperate for some respite and a chance for our extremities to thaw out we retreated into the safety and warmth of the recently built or rather recently completed Harpa Concert Hall (Reykjavík’s performing arts centre), which stood half built for a number years when construction came to a halt as the global financial crisis took hold. The project only resumed after the government secured funding for the rest of the building’s construction costs. 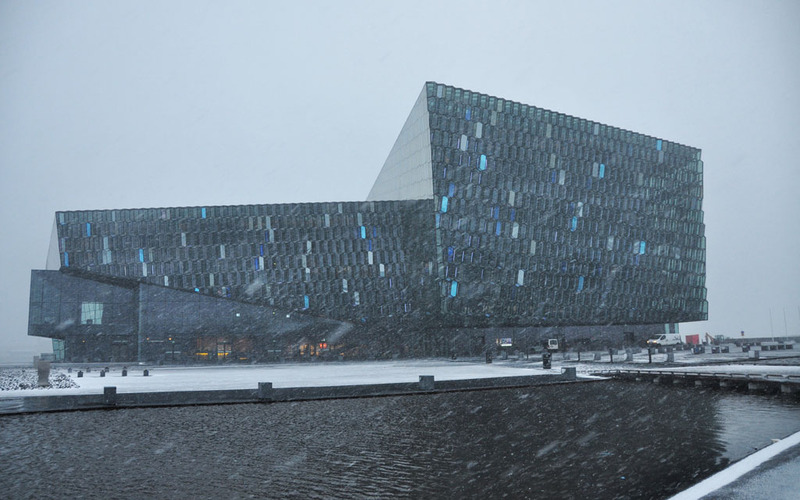 As we walked around the ultra modern and ultra sleek concert hall, I caught a glimpse of my reflection in one of the thousands of glass panels that make up the exterior wall and I noticed that even my eyelashes were encrusted with snow. I looked less like a traveller and more like some sort of strange ice creature. With the feeling having come back to our fingers we headed back into the town centre for a free walking tour. 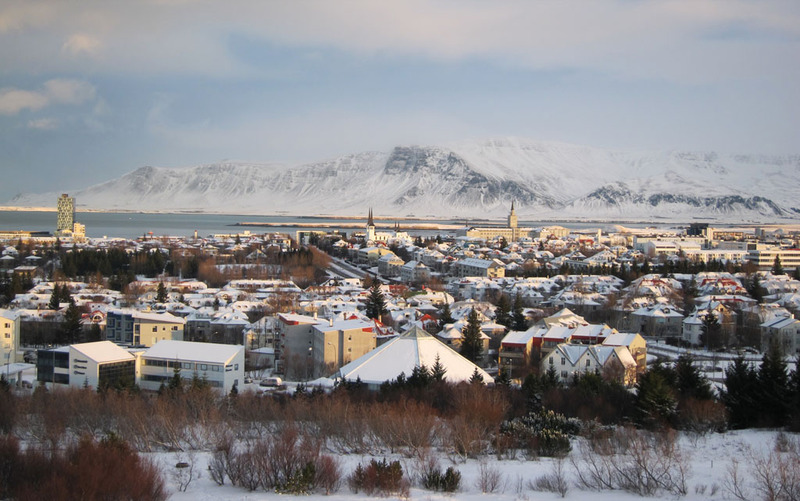 Like in other major cities, we have found the free walking tours to be a great introduction to a city and Reykjavík’s tour was no exception. The two hour walk allowed us to get our bearings as well as learn about the city’s and country’s history, culture, politics, economy, language, religion, values and folk tales. Our guide on this occasion was a knowledgeable, opinionated and slightly mad local, who lead the tour with great humour and insight. The local know how he bestowed upon us was invaluable so to were his recommendations on where to eat and drink in the city. 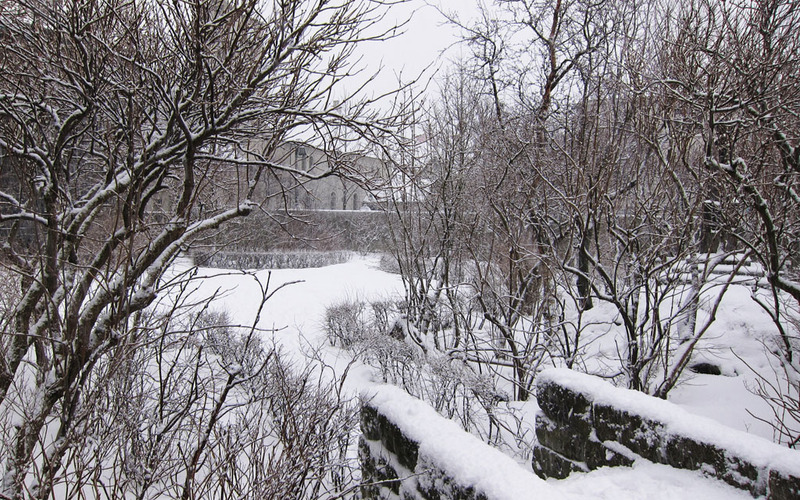 As we walked around the city’s points of interests the icy conditions became unbearable for some. Nick and I stuck it out though and I’m so glad we did as we got to hear our guides commentary as we walked through various town squares and gardens, past Ráðhús (City Hall), around the frozen Tjörnin (The Pond), along Reykjavík’s main street – Laugavegur – and as we marvelled at the impressive and somewhat imposing concrete church – Hallgrímskirkja. Also as luck would have it the snow clouds, which had been following us all day dispersed as we reached our final landmark, allowing for a brilliant sun set over the city. After saying goodbye to the group Nick and I rode the 75 metre high elevator to the top of Hallgrímskirkja (a must), where a viewing platform awaits and provides amazing panoramic views of the city and it’s surroundings. On our visit to the top we were granted with a sweeping landscape of icy hills and a little metropolis blanketed in snow. On our descent I was no longer able to ignore my grumbling stomach so we headed to a local tapas bar, Tapas Barinn on our guides recommendation. Not a particularly Icelandic meal you might say but in recent years Icelandic cuisine has incorporated a whole range of foreign influences. This was tapas with a local Icelandic twist. Nick and I steered away from the Puffin and Whale though (we would rather see the locals than eat them) but enjoyed a selection of other meats, fish and vegetables. Both eager to get out and explore the next morning Nick and I made our way back to the hostel with bellies full, and as my thoughts turned from food to what an amazing first day in Reykjavik we had, I could all but wonder what adventures still lie ahead. You would think that being in a country where the sun rises after ten would force us to have a sleep in, but no such luck. There was a lot of ground to cover on our second day as we embarked on the popular route called the Golden Circle and with fleeting daylight it meant that we had to move quickly. The 300 kilometre round trip has become a well-trodden path for tourists and for good reason, as it encompasses some of Iceland’s most stunning natural phenomenon, Pingvellir National Park, the waterfall Gullfoss (Golden Falls) and the geothermally active geyser field. Our first stop was the world heritage listed Pingvellir National Park – a place of striking beauty and also Iceland’s most important historical site. Pingvellir was the site of the first Icelandic parliament more than a thousand years ago. In addition, Pingvellir is also the site where the North American and Eurasian tectonic plates meet. 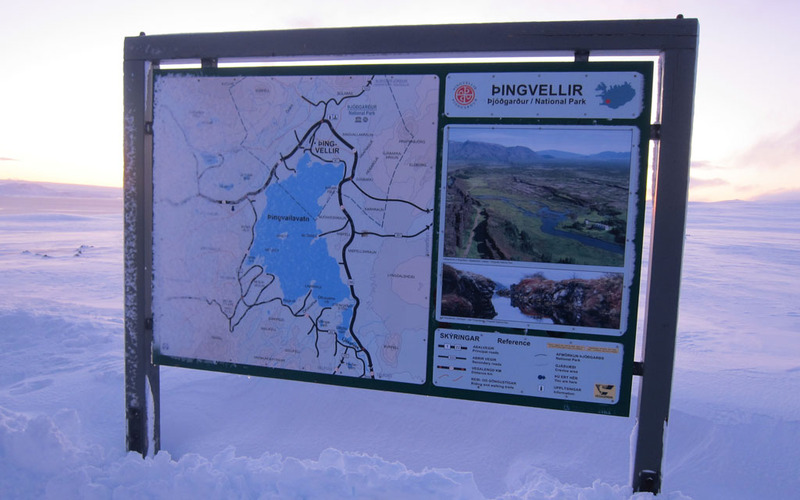 It is the slow drifting apart of these plates that help create Pingvellir’s unique rugged landscape of deep rifts and wide valleys. We actually had no idea that we had reached the park or that we were in fact driving through it. Nick and I had only seen photographs of the park in summer, which showed rippling valleys of lush greens and earthy tones, flowing streams and rocky canyons. The landscape that we were driving through of wide, snow-crusted valleys could not of been farther from this image. Somehow we managed to spot a signpost, just visible through the piercing white surrounds, which revealed an image of the park in all its summertime glory. Only then did we realise that we were in the right place. The transformation of the landscape was unbelievably dramatic. The environment in which we stood looked so otherworldly that it reminded me of childhood visions of what it would be like to walk around on the moon. This magical experience was made even more so by the rising sun, which illuminated the sky with subtle shades of pink and orange. The sheer volume of snow was equally as impressive and worth noting. The snow was so high that only the tops of picnic tables could be seen. Walking through the incredibly deep snow we had to heave our bodies before our legs became buried. After taking an absurd amount of photos we got back into the car to continue onward with our journey. 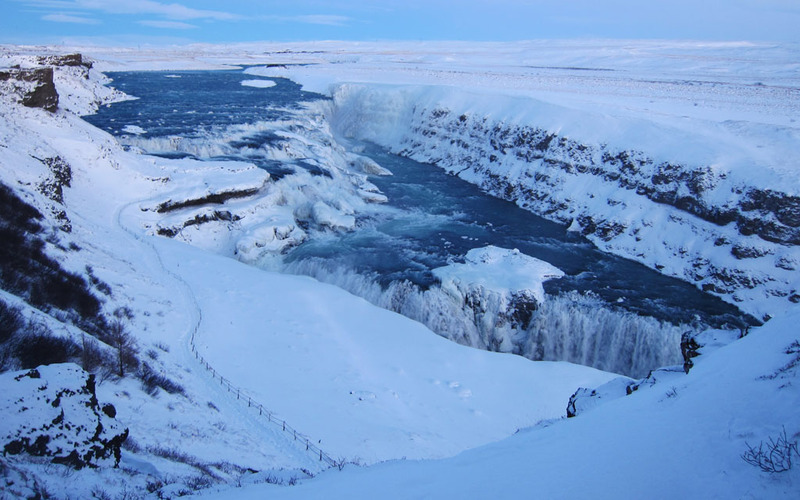 After an exhilarating few hours on Langjökull Glacier Nick and I returned to our Golden Circle path and made our way down to the spectacular glacial waterfall Gullfoss, where a thunderous rush of water falls between a huge crevice and simply disappears. From just one look you can see why this place is so special and why it draws the attention of so many sightseers. On a warmer day I’m sure you could sit out for some time wistfully watching the plunging water but as the temperature creped further into the minus’ the cold became too much, so we found refuge in the conveniently located Gullfoss Café. Following a warm and hearty serving of Kjötsúpa (lamb soup), an Icelandic traditional dish we were ready to get back out into the frosty air and hit up our third and final destination the Geyser fields. Pulling up to the Geyser field a little after dusk, I immediately became aware of a constant hiss and bubbling coming from the geysers themselves, which to be quite honest was a little spooky but actually added to the whole experience. As we walked along the path we didn’t have to wait very long for one of the geysers to go off. 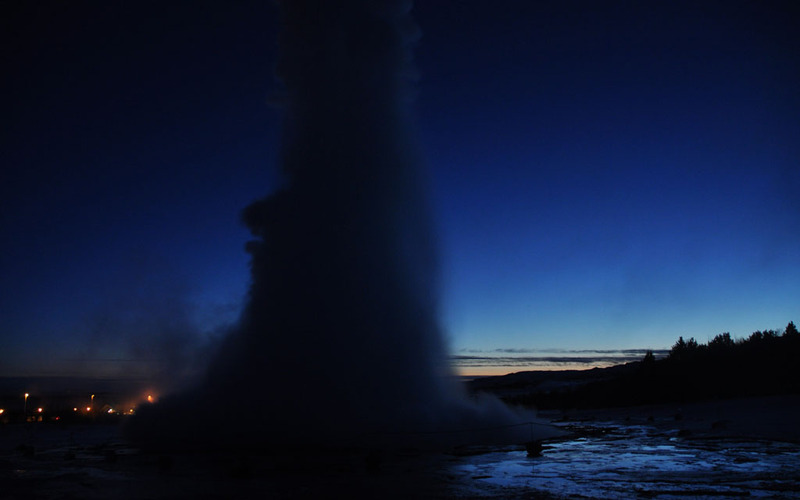 And there it was, an explosive geothermal blast of hot water through the earth’s crust. At times this spurt of water can reach up to 50 metres high. With every blast I had the same excited reaction and then waited impatiently for the next one. The sheer volume of people with flashing cameras also made it difficult to survey the night’s sky. With no luck finding the lights we climbed back on to the bus and were driven to a second location. Now shrouded in almost complete darkness we saw hints of green but unfortunately it remained no more than that. Day 3 saw a more relaxed start to the day, beginning with a short drive over to one of Reykjavik’s great architectural landmarks, Perlan. Perlan (The Pearl) is a complex that sits on top of six large water tanks that supply the city with hot water as well as boasting a 360 degree viewing platform that offers stunning views of the city’s surroundings. What’s best is that it’s free! Ultimately my eagerness to get to the Blue lagoon (our second point of call for the day) prompted our descent from the platform. And after typing its address into our friendly Tom Tom we were on our way. Despite our high expectations, the Blue Lagoon did not fail to impress. In fact, for me it was the highlight of the trip. Although the entrance fee was rather steep, I assure you that every penny spent, was a penny well spent. I only had to have my big toe skim the warm, cloudy blue waters to realise how incredible and totally surreal this experience was. As I waded further into the 38 degree (centigrade) geothermal water – the outside temperature dipping below freezing – I looked around and saw snow capped mountains, black lava fields and a low setting sun on the horizon – an image that will stay with me forever. While the act of bathing in a thermal pool is an established tradition in Iceland, today it serves as part of the country’s social fabric. 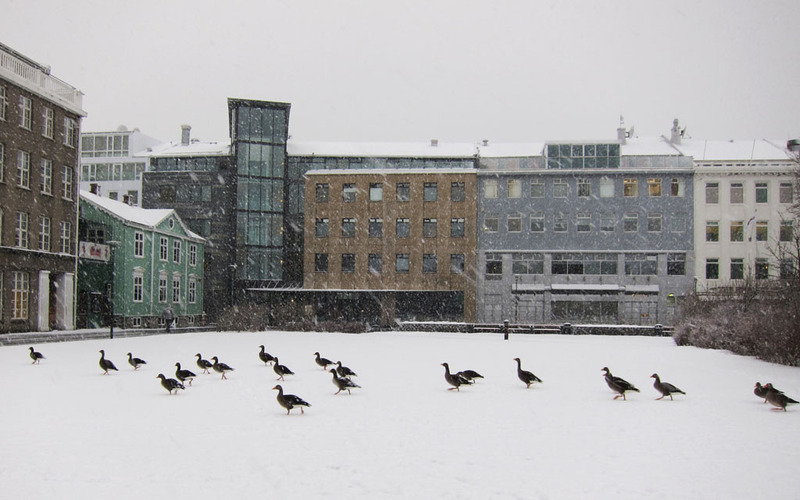 Indeed for many Icelanders it’s simply part of their daily routine. Not all Icelanders go to socialise though, many go to enjoy the health benefits from a good soak in the soothing, warm waters. 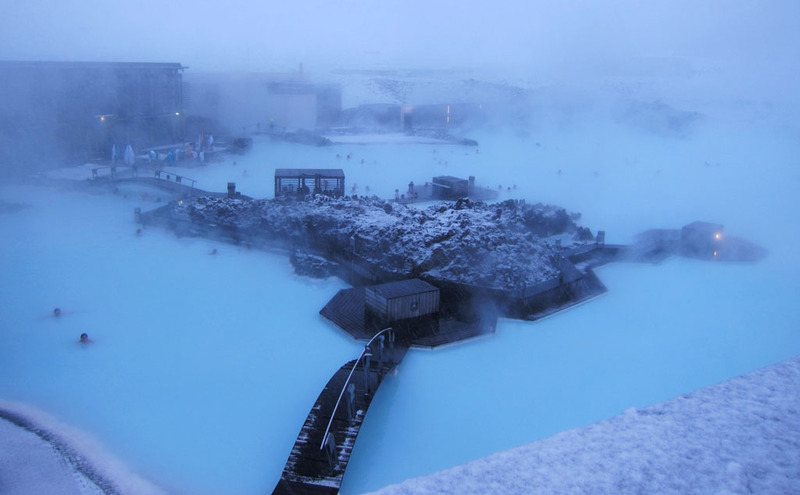 It’s a known fact that the superheated waters of the Blue Lagoon are enriched with a high concentration of silica minerals that have a rejuvenating effect on the skin. Wooden buckets of silica mud are placed around the lagoon for you to scoop up and cake all over your face. Of course Nick and I gave it a go and lathered our faces with the paste like mud. With the cold air the mud dried quickly, making the whole process rather facial-esque. I must say that after rinsing the mud off, my face certainly felt very cleansed. Who would of thought that Icelanders loved hotdogs so much? The Baejarins Bezt stand is renowned for its hotdogs, which themselves have become somewhat of a national food in Iceland, and has even seen the likes of Bill Clinton and Madonna stop by when they were in town. The tiny kiosk stands alone near Reykjavik Harbour and has been operating since 1937. The locals recommend that you order a hotdog with all the trimmings. That’s a ‘dog’ topped with sweet mustard, crunchy fried onion, raw onion, and remolaði, a mayonnaise-based sauce with sweet relish. Needless to say our hotdogs was super tasty! As temping as it was for a second hotdog our constant shivers demanded we find a warmer venue. Hello… The Laundromat Café. Situated on the main drag The Laundromat Café is a mixture of urban bar and old school diner and offers a warm and welcoming interior as well as a friendly and fun atmosphere. And as the name suggests the cafe also houses a laundrette so while you enjoy a burger and some home cooked fries your laundry can be left to wash away downstairs. Also shelved along the bar is an extensive collection of books as well as an array of board games, which you can read or play while you either wait for your laundry to finish or in our case while you escape from cold. With such a comfortable and cosy surroundings Nick and I could have stayed all night but determined to see the Northern Lights we embraced the extreme cold and went in search of the Northern Lights ourselves. We packed our car with maps, cameras, a mountain of spare clothes and a Thermos pot of tea and after driving around for the perfect spot we ended up back at Pingvellir. Braving the freezing conditions Nick set up his tripod and then waited with it so that if or when that moment came for the lights to show themselves he would be ready to capture them. Me, on the other hand retreated to and from the car for warmth and sanity. I wore five layers of clothing and wished for a sixth, but of course I forgot all about that when my eyes caught sight of a ghostly greenish glow. 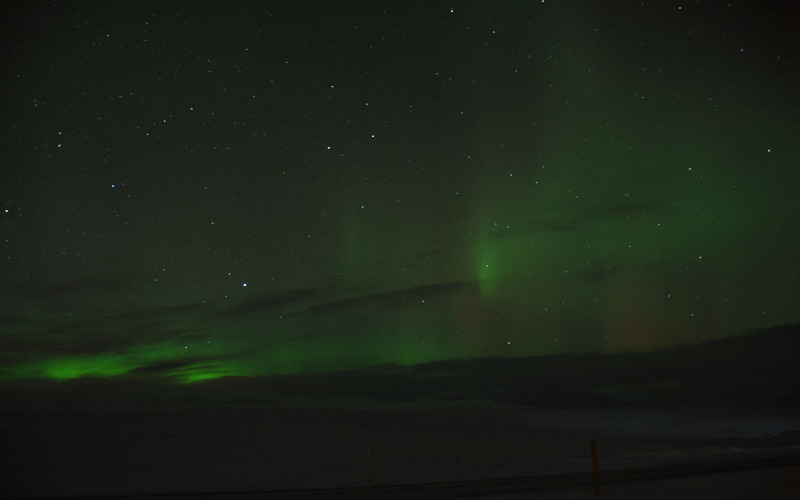 Standing under the star studded sky illuminated with brilliant streaks of green, I could not believe that our hunt for the Northern Lights had been so successful and to happen on our final night – such an incredible end to a truly amazing trip. One of the best things we did was to hire a car. Every part of Iceland is so different and you don’t want to just see and experience it through the window of a tour bus. A hire car will give you the freedom to take your time and stop wherever and whenever you want. Be sure to get a 4-wheel drive in winter. We did not and had a few urh… shall we say ‘interesting’ moments on the road. Also don’t always listen to the Tom Tom. The one we had kept trying to tell us to go down a one way road the wrong way. 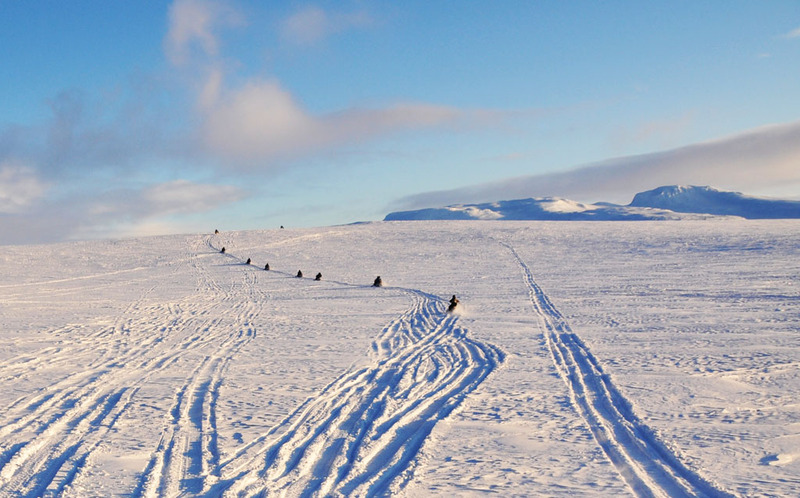 If you’re travelling to Iceland in winter definitely put snow mobiling on your things to do. The company that Nick and I chose to go with was Mountaineers of Iceland. The company was professional and friendly and answered all our questions we had before we even landed in Iceland via email. Make sure you try the Icelandic dish Kjötsúpa (lamb soup) – you won’t be disappointed. Best Hot dogs in town! Great place to grab a burger! Tasty tapas in a friendly and fun atmosphere. Reasonably priced, convenient location, clean and spacious rooms with super friendly staff. 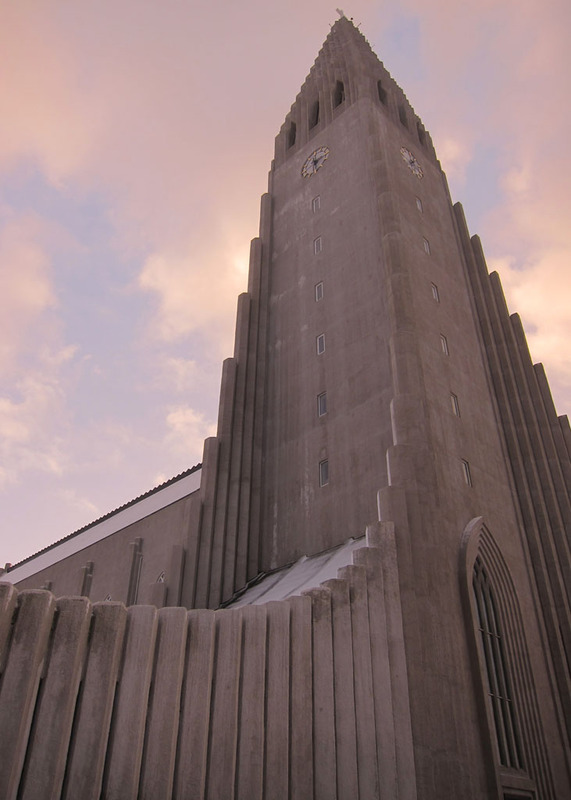 Take the elevator to the top of Reykjavík's impressive cathedral and enjoy the incredible panoramic views.